The Evil DM: This is how I roll! : D&D 3E is... Old School? D&D 3E is... Old School? I was sitting around readings some posts today while I was snowed in today, here in PA. When a buddy of mine from a group I played in long ago, sends me an email. Asking me, since I am so involved with the OSR, podcasting and running a forums, " Isn't 3E (not 3.5E) considered old school now? It has to be, its almost 12 years old?" My first response was no. Its not. But as I was typing back my response, I thought of some great questions to ask myself and others out there. First and for most... Why can't it be? 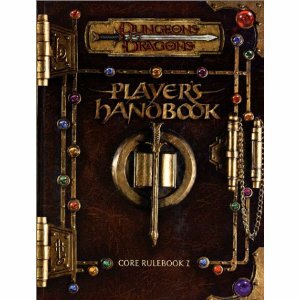 It's past the 10 year mark, its out of print and shunned by its creators and most of the D&D fans out there. If you are starting to scream here, just wait. Because listen to this. 12 years ago, 3E came out in 2000, which made AD&D 2E only 11 years old. At that point 2E was considered "Old School". Which everyone embraced as acceptable at the time. Now the once big bad "Beast of 3E" is nothing more then a discarded puppy outside, is 12 years old. Should we not give it a break and allow it to be considered some-what old school now? Well, when 2e was still around, was 1e considered "old school"? D&D from white box to Mentzer, maybe, but 1e was almost the same thing, a little outdated maybe, but not old school. I think, with Pathfinder, wich works similar enough to use the statblocks almost unchanged (just add things...), there's still enough 3e in it that 3e still isn't quite dead, but the foundation of a product still in print. You raise a good point. I think it should be, heck one day 4E will be in the club too. I'm not a OSR fanboy (wizards with 1 hit point and 1 spell? how fun is that?) but I think the "old school" name more refers to games that are very close to Gygax's original ideas - Thac0, descending AC, no miniatures, your character can do what seems "realistic" vs what skill rolls show, etc. So 3e, Pathfinder and 4e are the very definition of "new school." In fact, I would say there are three types of tabletop RPG: old school (original D&D), new school (Pathfinder), and indie (Fate). The nostalgia for old school D&D I think is closely tied to Gygax and Arneson. Not Cook et al. so if there's nostalgia for 3e it probably won't be for a few decades. Esp. with Pathfinder effectively taking over the 3E game. I don't think your buddy was thinking of the overall context. Good thoughts guys. Just wanted to point out, I don't believe 3E is old school, just wanted to throw up the idea with those questions. I think James has the right idea that player skill matters more then numbers on a sheet. With the right DM running the game, he or she can make any game feel "old school". I followed discussions on old school D&D around that time with a lot of interest and enthusiasm, but I do not recall 2e being mentioned as "old school" at the time. If anything, it was considered damage goods after TSR's years of mismanagement. Whenever products were brought up as positive examples of old school design, they referred to 1st edition AD&D/BXCM/OD&D, and mostly pre-Dragonlance products at that. The conflation of 1e and 2e into a shared "old school" category is something I believe to be a later product. Around that time, there were dedicated 2e forums and subforums, but they didn't mingle much with the 1e fans. And there was a good reason for that: the latter often tended to look down on the products they liked. That's one thing. For the second: words can, and do change their meanings. As much as people may dislike it, people will refer to 3e as old school the same way some fans of older D&D call themselves "grognards", a term once adopted by wargamers, and long before them, originated by Napoleon's veteran troops. And of course, to people outside small and isolated subcultures, these words don't mean a thing. I think that Melan has the right of it. Just as 2e being lumped in with 1st Ed. and Basic/etc. happened well after 2e was out of print, I can easily see the same happening to 3e. Perhaps it will force 2e out of the red-headed stepchild space that it fills currently. Whether it will be accepted by those who see "old-school" as more than "the old versions of D&D" I couldn't hazard a guess. That said, I think 4e has an even more difficult case to ever be considered in the same "school". The obvious reason for that being that it's an entirely new system that is mechanically incompatible with any previous edition. I don't think about old school games in terms of how long out of print, but rather a design that is derivative of original D&D. So everything up to 2e is old school. Everything after isn't. Why do people play the old-school games? Is it only nostalgia or do they genuinely bring something to the game that newer games don't? Is there something provided by OD&D, 1E and 2E that isn't provided by 3E?